In Part 1 and Part 3 we’ve told you about 10 most crucial inbound call center KPIs you can monitor daily, weekly or track over a specific period of time. In contrast, metrics presented in Part 2 might help you measure your outbound efforts. Calls per Hour is a call center KPI which, as its name suggests, shows the number of calls made by the agent in one hour. Knowing the average Calls per Hour lets you easily supervise your agents’ work. It gives you a clearer view of their performance. Yet, nobody’s ever said how many calls made in one hour is enough. That’s because it depends on how good your contact list is. It’s worth noting that Calls per Hour correlates closely with other call center metrics such as Contact Rate and Average Talk Time. Knowing all these rates, you’ll be able not only to estimate the number of outbound calls made but their efficiency as well. How to measure Calls per Hour KPI? Calls per Hour can be measured in two different ways: for an hour of agent’s work or for a clock hour. Either way: it’s not the result of a call that matters or even whether or not somebody answered the phone. It’s only the number of times an agent made a call. *Here we’re measuring Calls per Hour for clock hours. Contact attempts KPI refers to the number of outbound calls sales agents make to reach a prospect. Simply speaking, Contact Attempts demonstrate how many times an agent dials the same number to finally get the call answered. It’s quite common that agents don’t reach the prospect on the first call attempt. And there’s an enormous variety of reasons why the conversation between the agent and lead doesn’t happen: the number might be occupied, a call denied or not answered at all. More than that, nowadays agents have to make much more touches per lead and customers and what’s important, make those touches more personalized. So, just don’t give up, it could take even 18 calls to connect with a prospect. 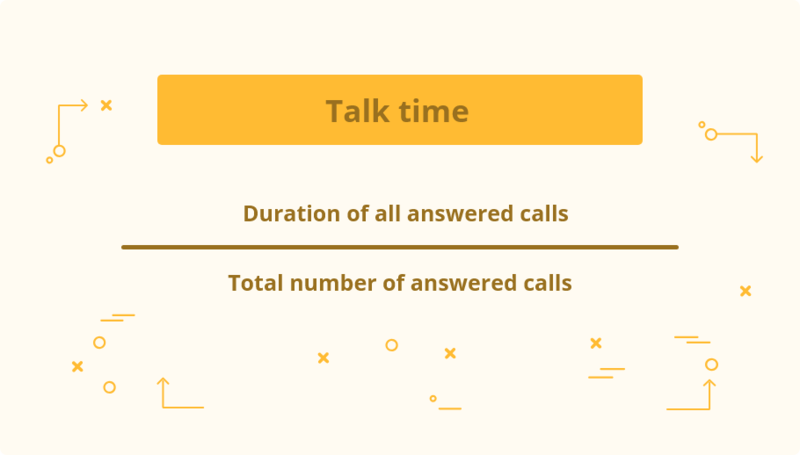 Average talk time tracks the time agents actually spent talking to the customers, excluding any kind of pre-call preparation or post-call note-taking. It is worth mentioning here that calls handled by young agents who just begin their career may take longer as they’re still new to your product or service. How does the average talk time formula look like? According to Gong.io, a conversation intelligence platform, to analyze end-to-end customer communications, the most popular talk times between salespeople and their prospects are 30 minutes and an hour. Having analyzed more than 30,000 sales calls, it turned out that customers are 12% likelier to answer the first call if it’s scheduled for a half an hour rather than a full one. Right party contact is a call center KPI that is pretty similar to a regular Contact Rate, however, here you measure calls answered by a decision-maker compared to the total number of call attempts. What is the formula of a right party contact rate? As it was already mentioned, in the world of sales, Right Party Contact Rate is the ratio of outbound calls where agents reach decision-makers compared to the total number of call attempts. To make your outbound calls more efficient and increase your Right Party Contact, keep testing the times when people who represent the true opportunity answer the phone most often. It’s likely that those mornings of business managers are set aside for planning and attending meetings, so find out when it’s better to reach them out. According to multiple surveys, the most appropriate time to call is 4:00-5:00 p.m. By calling in the early evenings, you can avoid the gatekeepers’ office hours. Early morning hours also work for sales contacts, but best practices show that this time of day is still controversial and depends on the industry or line of business. First Call Close is one of the most controversial call center metrics within the industry as most salespeople don’t attempt to sell on the first call. However, it exists and is widely used in B2C. First Call Close KPI covers the number of call closes (let’s say, sales) on the first call with respect to the total number of calls made by agents. It’s believed that sales reps with high First Call Close rate are bordering on the reality and are doing a really fantastic job to sell efficiently. How to measure the First Call Close rate? Although it usually takes a couple more calls to evaluate sales opportunity and close a sale, you can properly prepare for the sales call and you improve your odds of winning a new customer. Check out your prospect’s social media profiles including LinkedIn and look particularly for familiarities. Simply speaking: the more things you have in common with your lead, the higher your First Call Close rate will be. Monitoring various KPIs is crucial for growing your business. However, even if you have all the important data, being able to interpret it correctly is even more important. This 4-part series was created specially to show the importance of call center metrics, which ones are supposed to be high and which are more profitable kept low. Hope we assist you with narrowing down the long list of outbound and inbound KPIs and help you focus on the metrics that really matters.